This post is written in conjunction with Sean Sweeney, Public Safety Communication Specialist for Telecom Communications, Inc.
October is Fire Prevention Month, and a time of year when fire departments visit schools to talk about fire safety, smoke detectors and what to do in the event of a fire in the home. One item that is addressed is changing the batteries in your smoke detector. However, what about the batteries firefighters, EMS and Law Enforcement use? We need to change those from time to time, but we often forget. Batteries go bad, get abused, bounced around and when we think they have been recharged for the last time, we discard and purchase new ones. This doesn't have to be the case. You have options. Depending on the type of battery being used (impres vs. non-impres) you can either opt for a Battery Fleet Management System or a Battery Maintenance System (BMS). To learn more about impres technology click here. 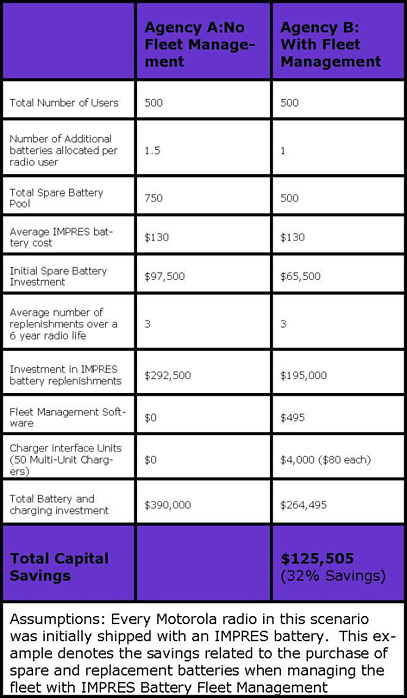 The IMPRES Battery Fleet Management system is transparent and allows your organization to manage hundreds or thousands of radio batteries and chargers wherever they may be located. It automatically and remotely retrives key battery data from any compatible IMPRES charger each time an IMPRES battery is inserted into the IMPRES charger. The information is collected and you choose whether you want to view predefined or user-customized reports. This will allow you to see a database of active batteries, purchase reports for batteries, lost battery report and more to keep communications reliable and productive. For more information on the IMPRES Fleet Management system, download this application brief. The Motorola Battery Maintenance System will analyze your battery (up to 6 at a time) and recondition them. Using interchangeable battery adapters (sold separately), the BMS Plus is capable of charging and discharging, analyzing, conditioning and cycle test on batteries. At the end, you will be able to see whether you need a new battery or if you can get more use out of them. This helps prevent you from discarding a battery that might last you for a few more months or even a year. Batteries are not cheap, and wouldn't it be nice to have a little extra cushion in your budget when funds are not always available? By using one of the above systems and optimizing your batteries, you not only save money on replacing batteries that didn't need to be replaced, you also can budget for the replacement when they finally do give out.